Welcome to 2013. It’s time to order your chicks or make preparations for the feeder pigs you’ll buy in March and generally get ready for the growing season. Soon the farm stores will offer chicks for sale and you’ll be tempted to finally take the leap. This is the year. We’re really going to do it! Good for you! But let’s approach this with a measure of sobriety. But you can also underestimate how hard it is going to be. How hard it will always be. You may become more efficient at keeping your little flock of birds and you may get faster at processing chickens…but that will just encourage you to raise more next time. Your profit margin will always be low but you can increase your cash flow by moving more inventory. So, you raise a few more. You are better at the work and more efficient per unit of chicken but you are still DOING THE WORK! It is never easy to roll out of bed at 2:00 in the morning, find your shoes, load your gun and run outside to kill whatever you can hear attacking your chickens this time…only to realize you forgot your pants…and it’s 20 degrees. The next morning you will be tired. This cycle can continue forever. More production, more skill, more raccoons, more chickens, more customers, more packaging, more ice, more, more, more forever. Forever. Forever! So, yes, you can. You really can. But it’s harder than you think. When people ask me how to get started we try to sit them down for a serious conversation. These same discussion is written in numerous farming books but I think it’s worth hitting the main points before moving on. All of these are #1 but I have 5 number 1 rules. 1. Start small. No, smaller than that. If you want to raise chickens, raise as many as 50 for yourself. Just see what all the fuss is about. Ideally you’ll brood broilers late in summer about 7 weeks before your first frost. Then you can butcher on a cool day when the flies aren’t flying and you’ll have all winter to consider your experience. Or just skip the broilers and brood 6 layer chicks. 6 birds will give you far more eggs than you can eat. 2. Go slow. Don’t start out with layers, broilers, pigs and a goat. The learning curve is too steep. If you feel you have a good handle on raising and selling broilers, maybe try your hand at a couple of pigs. Once that is mastered, add the next thing. Take your time. Pay your dues. 4. Don’t go it alone. This should be listed first but I’m too lazy to re-sort them. If you’re married you need your spouse on board. If your spouse doesn’t want to use a bucket potty just give it up. It’s not worth your marriage to go potty in a bucket. It’s also not worth your marriage to bask in the glory of a compost pile full of blood and feathers. If you’re not married, consider finding someone to help you. Animals eat every day. Even when you have the flu. 5. Read books. Shoot your television, get on a first-name basis with the librarian (you’ll sell her chicken later), park your tookus in a comfy chair and start going through your book pile. Goat Song gave a great example of this recently. So what’s this all about? A couple of things. First, I was sad to read that our friends at Porter Pond Farm are hanging up their hats. They worked hard, ate awesome food and fed their community. But they worked hard. They may have worked too hard. Take a moment, follow the link and read their story. There is a lot of temptation to mash the accelerator pedal of farm production. “By golly, if 100 chickens and a cow are good then 2000 chickens and 10 cows will be great! Heck, with 20,000 chickens and a 40-cow raw milk dairy we could ditch our day jobs…and we could do it in 3 years!” Well, yes, you could…but I really don’t think you can. I honestly thought I was going to die. Double unders are hard, but the burpees did me in. First crossfit workout. 2 complete rounds, much tired. I bit off more than I could chew. Now, I was young, stupid and a total glutton for punishment so I came back for more. And more. But I backed way off on my intensity and my expectations and that paid off. I was a bit of a fanatic for a few years there. The intensity and discipline required to maintain that performance level ultimately proved more than I could maintain. Because I realized my error early on and backed off for a while, sought coaching and took my time building skill I was able to achieve some real successes in CrossFit and make positive contributions to the community. “I don’t want to farm alone.” Chris, that is something I am starting to understand at the end of my first production season. All my past farming experiences and internships had been a team effort. This season it was primarily me, and something was lost. There are other concerns, but recently I stopped having fun and I am ready to call this a learning experience and move on. I have so much passion for natural, responsible, sustainable farming–I had to experience it. The season was successful, all the animals turned out great without incident. I am proud of that, but I have lost my vision to continue. Maybe I went too fast and burnt out. Maybe I am unwilling to make the family and financial sacrifices necessary to get through the rough curve of starting a small farm business. Maybe I finally found a challenge too big for me to handle. Maybe my joy is producing food for my family and friends, not producing food for the masses as a career. My relationship with my wife has become closer than ever over this past season as we’ve struggled with this issue. My wife’s strength and commitment to me is amazing. I felt the need to share my recent thoughts with you after reading your blog this morning. I have a deep respect for everything you are working towards. …go back and read Salatin. I can’t figure out which book but somewhere he says his first year they raised 450 broilers and gave half of them away. The second year they raised 300 and didn’t have enough. In PPP he says he raised 1,000 birds his fourth year. This is hard stuff. I completely understand what you wrote but don’t let a season of discouragement prevent you from pushing forward. Sometimes it’s hard. I have probably 60 dozen eggs I can’t sell right now. Soon I’ll solve that problem [ed: I sold them]. Who knows what is next. If it wasn’t farming something else would ruffle my feathers. I’m grateful to be in a position where too much food is my worst problem. If it isn’t for your wife, it isn’t for you. But if you and she are willing but discouraged, stay the course. I have at least 100 beautiful chickens down in the freezer. Thankfully they all fit, but I really overestimated my market. I’m really disappointed actually. People know about my birds, over 100 people alone on facebook, and I’ve given away over 20 just as samples. Even most of our family won’t drive out to get some great chicken. I just didn’t get enough positive feedback this season to feed my vision. And after studying my numbers closer, and after 3 weekends of serious processing, I can’t ever see reaching 10,000 birds or anywhere even close, not the processing of or the selling of. I am disappointed that I may not be able to make it work, especially when I have neighbor kids who come over just to marvel at the pigs and chickens–and these are rural kids. Sad that they’ve never seen a pig up close before. But i can’t ask my wife to sacrifice what it would take for me to commit to this in a way where it could work. It’s not her dream. Well, you can see I’m really tore up about this, just need to get it out. Thanks again for listening. You are right about 100 chickens not being a big deal. We just processed our final 100 broilers last weekend, and I really didn’t think they would all fit. Plus I need space for at least half a pig in a few weeks. The stress of the whole situation is causing me to blow these little issues into big ones. 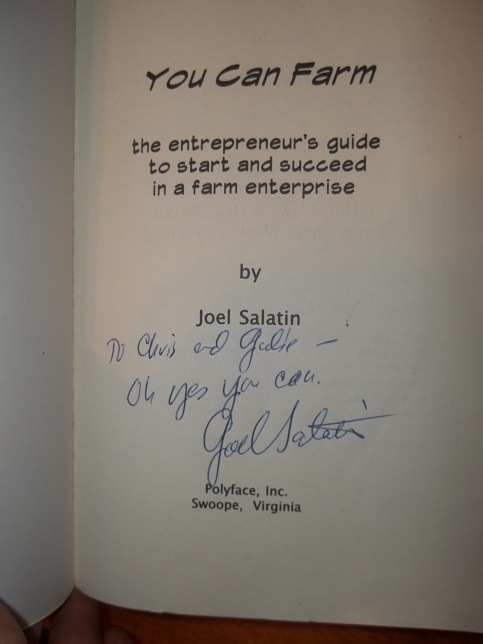 I’ve read and re-read Salatin. I wish I would have taken his advice and your advice and started much smaller. But I was way too excited. That’s why I am disappointed. I thought I would enjoy every second of this and spring out of bed every morning excited to be producing amazing food. Over the season I lost something. This is not uncommon. Salatin talks about lending out his old plucker to farmers just getting started. They quickly decide it’s too much work, return the plucker to Salatin and give him their customers…lol. If you are about to take the leap please, please start small. Ease your way into it. Test the waters. If possible, find customers first. But whatever you do, dream big, don’t get discouraged and move slowly. If there is someone else with you at the beginning, make sure they are with you at the end. Chris, it was good to hear from you today. I did have an amazing summer, learned a ton, got in great shape, and ate some of the best food I’ve ever tasted. I’m not exactly sure what’s next, but I hope to be processing a few chickens where ever we go. Take your time. Move slowly. Seek frugality. Relationships are more important than chickens. Keep learning. If you apply these ideas you’ll have fun and stick with it…for a while anyway. How does the Week Look? What does your week look like? I’m on vacation this week so I’m penciling in the plan. We got this mostly roughed in during our weekly planning meeting yesterday but not all the detail. Weekly planning meeting? Yup. If we don’t sit down every week to sync up our planners we get lost. We also meet with the kids to find out where they want to go. There is supposed to be a big family meeting as we think it is important to involve the kids in family goals. That meeting was missed yesterday so we could attend the Sustainable Backyard Tour. This week I have a couple of books I want to finish reading, fence to build, chickens to process, bookshelves to design and build, wire to run, and ponds to swim in. That means I’ll spend the week reading to the kids, teaching about fence post placement, teaching anatomy, geometry, fractions, measurements and buoyancy. I also need to get the greenhouse ready to plant for fall crops and I may start digging potatoes…no rush on that though. Today is more filled out than Thursday. That’s kind of on purpose. I try to stay flexible. Things happen. Some projects drag out more than others. No big deal. 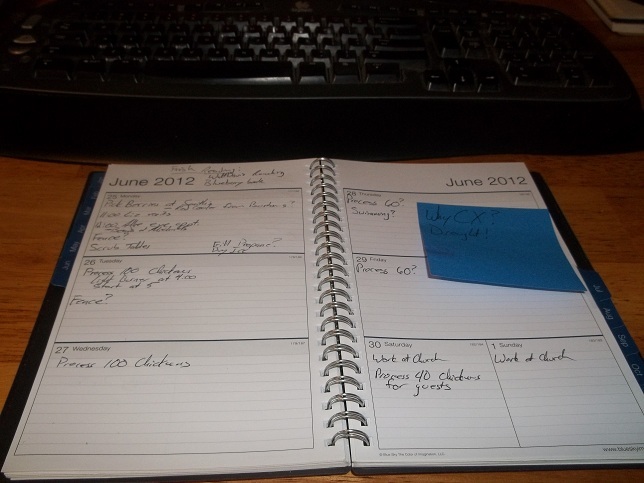 I have a to-do list and have that list prioritized. I’ll knock out what I can and if, by some miracle, I get to the end of my list I’ll find more to do. There is always more work to do. If things were right in the universe there would be no unemployment. But then, I try to avoid discussing politics and economics here. There is more work to do than can be done…it’s an issue of price. OK. I’m done. This week finishes out our broiler production season. We may run a small fall batch depending on sales but at this time we’re leaning away from it. Exciting times. Chicken evisceration, blueberry picking, raspberry picking, potato harvest, goat milking…it’s both fun and overwhelming at the same time. Everything has to be done at once. It has been that way since February. Ah, the good life. How about you? Staying busy? I hate that question. I work in tech. I have a hard time telling management, most of whom don’t work in tech, that I have no idea what changes are in store for my career. I don’t really see myself moving to management and if you try to explain current tech trends to HR their eyes glaze over and they just wait for you to finish talking. I like what I do and would like to continue doing it. Tech changes constantly and if I were to guess, 5 years from now I’ll still be diligently working to stay abreast of new trends, add value, etc. Looking back 5 years I couldn’t foresee the iPad. I couldn’t foresee (and still don’t really understand) Facebook. I have no idea what Microsoft will dream up next. I don’t think we’ll use keyboards much longer though. Looking at my farm in 5 years is a little easier. I’m a little restrained by the economy and have no idea how to pay for this but I have a vision of how I would like to reshape the farm over the next 5-40 years. 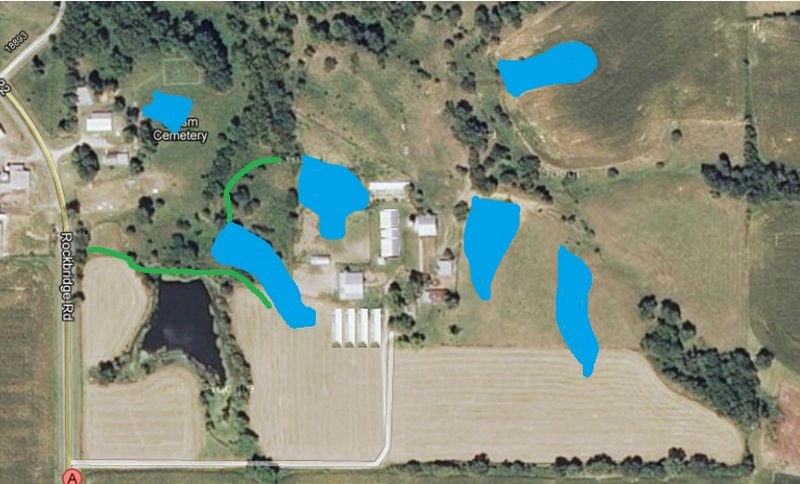 I have plans to add greenhouses and ponds, I have a plan for pasture grazing and improvement, woodlot improvement, establishment of new tree stands, orchards, swales and general beautification of the farm. On the topic of beautification I need to replace a number of buildings but that’s further down on the list. More water on the farm = more life. I need to build 6 or 7 ponds over the next few decades. I plan to transition our primary revenue generation away from chickens to cattle. We haven’t begun to build our beef herd yet. I hope to divorce myself from the feed grinder as it is both dangerous and expensive to operate. Further, it’s one more thing I have to store in a shed…a shed I need to replace. Instead we’ll use dense swards of grass to harvest sunlight, earthworks to harvest rainfall and cows to cycle nutrients. It’s a terribly complicated machine with no moving parts but entirely dependent on free and continued sunlight. I plan to use a solar-powered fence charger to keep the cows where I want them. To prevent wind and evaporation we have plans for tree plantings. These will be primarily fruit and nut trees but I would like a larger stand of sugar maples to tap in my old age. I better get started now! The fruit trees will give guests another reason to come visit the farm…another over-arching goal of ours. Everything we do should boost biodiversity, restore the local ecology, and help nurture our community. I hope to raise big, fat cows and have room for big, fat groundhogs. We plan to leave meadows ungrazed until the ground-nesting birds have hatched in July. I hope friends and customers continue to come here seeking rest and inspiration…or at least entertainment. I anticipate my oldest son will begin to step up his involvement in the farm and will either relieve me of one or more enterprises or will start some of his own. At 17 he should be ready to test his wings and I plan to enable him to do so. He has always been our guinea pig so he’ll set the pattern for his siblings. Whatever they are interested in, we are interested in. I didn’t list revenue in my planning. I can’t set financial goals outside of paying for the land and the improvements. I am not a corporation. This isn’t a machine. This is a biological process. Financial goals fit with biology like socks on a rooster. These are, of course, moving targets. These plans will likely shift as the wife and I dive deeper into our studies of permaculture. So I guess, like tech, my farming goals aren’t entirely knowable. It’s a best guess either way. But it’s easier to keep my audience interested when I’m not explaining database index optimization strategies. Yeah. So, there you go. The top-down view of the next X years. That question is so much easier than career planning. What about you? Where do you see yourself in 5 years? Will you finally achieve your “someday“?